Any material may be used but the theme is the same and the response is the same for all artwork… we all have the same concern, but the artist must know exactly what the experience is. He must pursue the truth relentlessly. Agnes Bernice Martin was a Canadian-born American abstract painter, often referred to as a minimalist; Martin considered herself an abstract expressionist. She won a National Medal of Arts from the National Endowment for the Arts in 1998.Martin moved to the United States in 1932 and became a citizen in 1940. She studied at Columbia University from 1941-1942 and again from 1951-1952. Martin's oeuvre often created a sense of delicacy, with the color floating off the canvas and a network of carefully penciled lines. Although classified as a Minimalist artist due to her emphasis on line, grids and field of extremely subtle color, Martin considered herself an Abstract Expressionist. Surveys of Martin's work have been exhibited at venues including the Institute of Contemporary Art at the University of Pennsylvania, Philadelphia; the Stedelijk Museum, Amsterdam; the Whitney Museum of American Art, New York; and the Menil Collection, Houston. 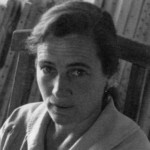 Agnes Martin died December 16, 2004 in Taos, New Mexico.